When Plato exiled creative artists from the Republic, he had a good reason: Artists lie. “The maker of the image knows nothing of true existence,” the philosopher says, “he knows appearances only.” Since then, philosophers may have reconsidered the relation between true existence and appearance, but the relation between philosophers and artists has remained the same. Artists still seem like a people in exile, stumbling along in darkness. “If only we could teach artists to speak the truth,” philosophers from Plato to Hegel to Schopenhauer to Adorno have sighed. “Then, finally, they could find their way home.” By “home,” of course, they mean philosophy. I’m not being fair. Their response, really, is to produce more art. But from the theorist’s perspective, making more art sounds like “whatever.” It just perpetuates the problem. When faced with the bewildering disorder of art, critics want to clean it up (we say, “to understand it, theorize it”). Artists, however, want to mess with it, mix it up, keep it wild. I want my students to express their thoughts more clearly and to understand what I mean when I say, “commodity fetish,” “logocentrism,” and “the gaze.” They want to excel in their chosen media, to create innovative work. It’s Plato’s fault that this seems like a contradiction. But it’s our fault as teachers of the humanities if we cannot resolve this apparent contradiction for our students and ourselves. Ideally, art and philosophy share a goal. In one medium or another, both aim to increase our perceptual acuity. We want to “see” and to grasp what we see more clearly. But an artist sees and grasps with the materials of art, while a critic employs the tools of conceptual thought. 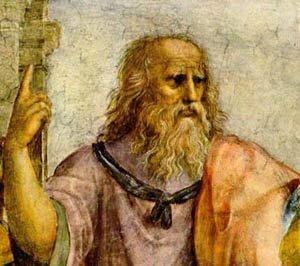 It was Plato’s prejudice that conceptual thought was superior to all other methods. When teachers of the humanities accept this prejudice uncriticallywhich happens all too routinely, unconsciously, and understandablyI think we fail both as theorists and as teachers. Creating art is an intensely critical activity. The artist is constantly evaluating materials, engaging art history, and analyzing his or her own proclivities and assumptions. In the best case, then, I can teach them to be more critical, more precise in their questions. In this way, they learn to use the instruments of conceptual thought to solve perceptual problems or to accomplish specific perceptual tasks that they already sense. The result, one hopes, is that students learn to see and grasp their own media in new ways. Unfortunately, however, because most teachers of the humanities are critics and not artists, we too often respond defensively. It’s understandable. We want our students to know the best of what has been said and thought about art. Therefore, we justify our discipline by teaching “theory,” that is, the abstract results of critical activity (the terms, the concepts), rather than the methods of critical perception itself. Like dutiful children of Plato, we teach our students how to speak like critics. The terms are as predictable and self-important as they are conventional and meaningless. This alone should convince us that the humanities departments at art schools ought to take a slightly more critical look at themselves. It seems to me we shouldn’t teach “theories,” but critical problems. There really is no reason why students need to know what Laura Mulvey means by “the gaze” or what Marx means by ‘alienation”until the students understand the problems that motivated these theoretical constructions. But if students engage with this problem, then Marx’s or Mulvey’s concept is no longer the “content” of what they learn. It becomes an example of how theorists engage with the world using the tools of conceptual thought. That’s a fundamentally different classroom experience that learning “theory,” a fundamentally different education than studying Marx. Teaching a syllabus of theories, we’re giving students the answers to questions they haven’t asked. Teaching critical problems, we help them to identify and formulate their own questions, and we encourage them by example to produce their own “theories”not in words, but in their own media, their own styles. In this way, we teach them to see and grasp conceptually; we educate them to be better artists. — Glenn Kurtz is a Bay Area author who teaches as the California College of Art. - To me, this seems less an issue of how best to teach theory and criticism, and more an issue of teaching writing. As a curator, and as someone who reads statements and wall text when I see art, I’ve seen innumerable examples of what the author mentions, and worse. Perhaps the coventional and meaningless prose is a result of poor understanding of theory or inadequate methods of teaching, perhaps its an ex post facto application of theoretical language to work the artists didn’t do much theorizing about. Maybe the artists just aren’t very good at or comfortable putting their thoughts about their work into words. Perhaps it’s an attempt to provide academic justification (in the form of this academic language) for work thats academic value could be questionable. Making art in an academic environment can often lead to applying structures and processes of other academic disciplines to art-making. In the humanities and social sciences, it is standard practice to research work done in your field, and draw from and cite past research and literature on one’s subject matter in one’s academic output. I’ve been wondering as of late, if that practice has filtered over to art, and is why a lot of the art coming out of MFA programs appears insular, derivative, and “overly clever,” and lacking in, to use an untheoretical term, personality. I want to agree with Glenn AND Sarah, but also to diverge a tad, based my own actual experience of tutoring MFA candidates. It is my opinion that, at least in the last 10 years, visual art education has had to justify itself against both science/technology/theory/social science education structures and against the simply gross cost of attending art school. For the former, the MFA thesis (which is often shortend to become an artist statement) has become a product that supposedly shows the artist has become educated by buying into a academic thought that language and writing skills equals intelligence (I will only say I would rather equate intelligence with how one *uses* language and writing, not to mention technology, a paint brush, etc…). The latter, cost of education, is by far the most insane of education costs: compare what private art school education is to State College education in any discipline, and the jaw is very likely to drop. What does a student actually *get* from attending art school, anyway? There is no guarantee that they will be a good artist, is there?!? I have tutored international MFA candidates at the Piet Zwart Institute in Rotterdam the Netherlands for over two years now, and my biggest issue with this requirement of a 20+ page thesis isn’t that it is a requirement for visual/performance-based art education (on the contrary, I agree with Glenn Kurtz that being critical about art and your own pracice *is* leading to being a better artist) but that the art of writing and the art of being critical is not given any sort of equal weight to other points of study in the program—in two academic years, the MFA candidates are given only, maybe 14 hours of writing instruction!!! 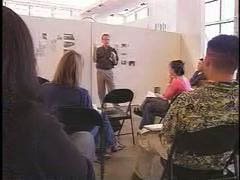 Here, I agree with Sarah Lockhart in that many art students are not given a good eduation in writing at all, therefore, even if the MFA candidates are thinking critically and observing the world around them in unique ways, to write this out in a succinct statement or critical review, is far from guaranteed to translate into written words without learned writing skills. One problem to overcome in the academic environment, and something Glenn writes about already, is the willingness for art students to see the value of learning how to write, to be able to translate those same thoughts that go into the visual art they produce, into an awesome artist statement or critical review. It seems to me that what would be mrore appropriate is for the artwork to try to be “intellectual” and embody the artist’s thoughts (alright all you artists our there, I challenge you!) and leave the writing to be more creative (make your text be more like that painting, dammit! ), and as Sarah notes, more personal. On the other hand to all this, take a stand and just don’t write.